Graphene is a sheet of carbon, just one atom thick, which is electrically sensitive to mechanical deformation and contact with water. Not only this, but it is highly effective at repelling water too. It’s also far cheaper to obtain than Indium, which is used in Indium Tin Oxide (ITO) for current capacitive touch screen technology. Therefore there is a benefit to the environment too, by reducing the demand for industrial mining operations. As explained in our other feature about Nokia’s Nano-Tech, Graphene is a structure made from Carbon atoms bonded together in a planar hexagonal pattern. By definition, sheets of Graphene are only one atom thick, but have amazing properties. 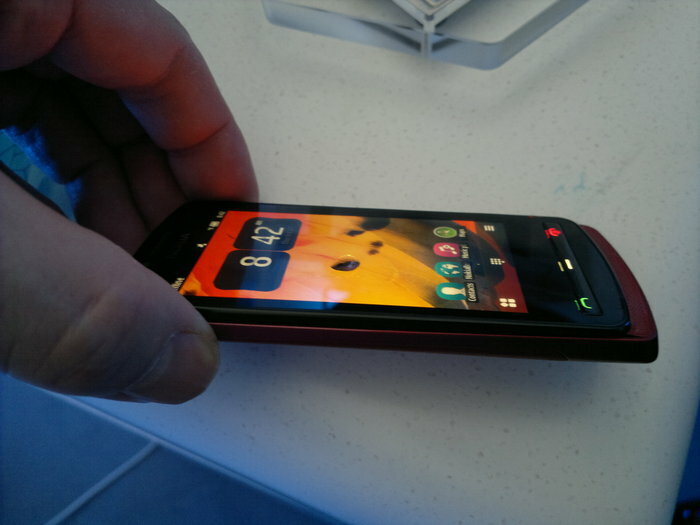 At Nokia World 2011, we found a customised Nokia 700, whose screen had been given the Hydrophobic coating. We were told that the Graphene layer is 97% transparent. Indeed, the screen looked just as crisp as an ordinary 700. This is an improvement over current ITO technology which is 90% transparent. We were told that the coating was made up of a grid of Graphene tubes (i.e. Carbon nanotubes). Each line of the grid was made up of multiple nanotube strands, putting their width on the order of micrometers. However, the structure is still only one tube thick, keeping it on the nanometer scale. We were also told that the Graphene layer is thinner than the current ITO layers, which accounts for the increased transparency. The width of the grid lines are similar to a human hair, and therefore should just be visible to the naked eye. Indeed, part of the demonstration apparatus we saw had a sample piece of polymer with a nanotube grid overlaid, on which we could just about see the grid lines. Because water cannot interact with Graphene, it makes for an ideal water resistant coating. Therefore, entire phone bodies could be covered in Graphene to make them more resilient in wet environments. The advantage of Graphene doesn’t stop there though. The nanotube grid can be mounted to the phone screen with a microscopic air gap. This configuration then acts as a capacitor, with an air dielectric. As droplets of water touch the Graphene layer, the capacitance of the air gap is changed, which can be easily detected and read as input. 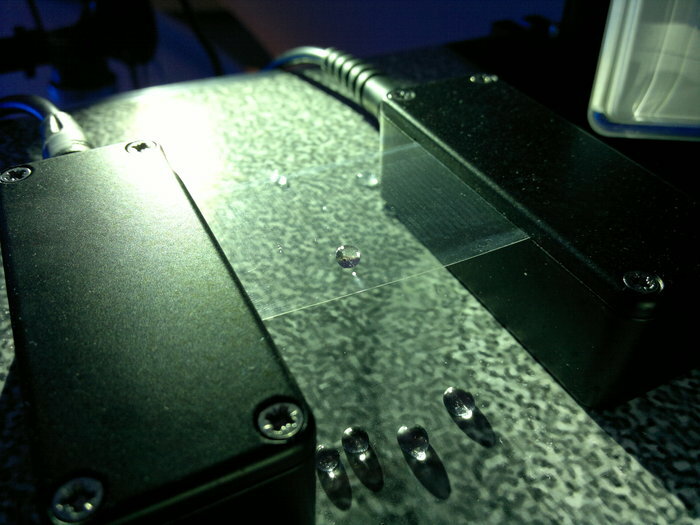 As a demonstration of both the water resistant (Hydrophobic) and electrostatic properties of this coating, the Nokia 700 was used to a trigger a high speed camera. 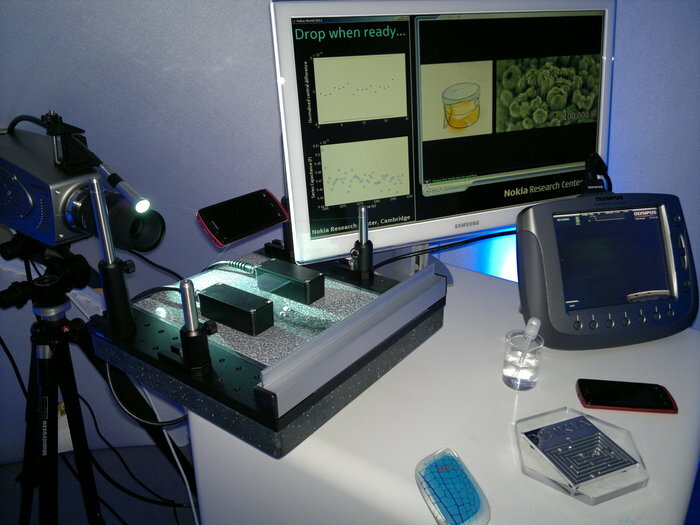 The phone was fixed at an angle above the polymer sheet, and when the demonstrator dropped water on the phone, it activated the camera and ran straight off the screen. High speed video was then captured of the water droplet falling on to the Hydrophobic coated polymer. The video recording was played back to us, and we could see the droplet hitting the polymer in slow motion. On impact, the droplet spread out under its own momentum. However, because it couldn’t mix with the Graphene, the surface tension of the water pulled it back into a spherical shape. The droplet effectively maintained that shape due to the repulsive forces of the Graphene layer. This technology has the potential to provide a new form of capacitive touch screen, while making mobile phones more robust. However, Nokia still needs to adapt the material so that it reacts to the oils in human skin, instead of water, but still be Hydrophobic. Another benefit of Graphene capacitive technology is that it’s far cheaper to produce than current capacitive touch screens. The Indium in ITO is becoming increasingly scarce and expensive. Meanwhile, Graphene is just an allotrope of Carbon and will be far cheaper to obtain, with less polluting byproducts.